Taxicabs are a large part of the Chicago transportation system. Considered “common carriers,” these cars and vans are available for hire, and under Illinois law, their drivers are expected to ensure the safe transport of their passengers. However, regardless of what the law may state, taxi driver’s income depends on accumulating as many passenger fares as possible. That often means in their minds that speed takes precedence over safety. The Chicago taxi accident attorneys at Rosenfeld Injury Lawyers LLC recognize the dangers faced by motorists, passengers, pedestrians and cyclists sharing the crowded city streets with cabs. Our office is committed to holding negligent cab operators entirely responsible for their acts when it comes to getting compensation for our clients' injuries. If you, or a loved one, was injured in a Chicago taxi cab accident contact our office for a free consultation. 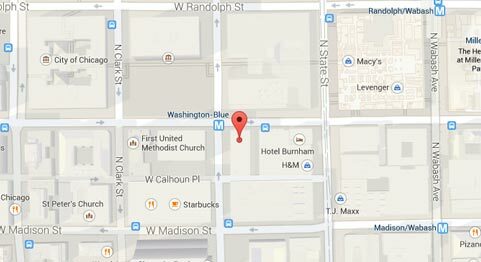 Just Who Is At Risk For Getting Injured in a Chicago Cab Accident? There are approximately 7,000 taxicabs registered within the Chicago city limits. Chicago taxis are unique in comparison to many other major cities as they are all not a particular color, like the standard yellow cabs seen in many cities, and their drivers do not need to wear uniforms. 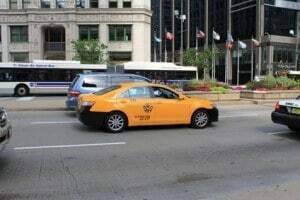 This means that spotting these fast-moving vehicles may be more challenging in Chicago because the taxis may blend in with the other cars and vans sharing the road. Passengers. Those riding within the cab may be hurt when another driver hits the taxi. Motorists. Motorists who share the road with these fast-paced common carriers may be rear-ended, sideswiped or even cut off in traffic, causing serious accidents. Pedestrians and bicyclists. Some of the most vulnerable to taxicab accidents are those on bikes or on foot. A taxicab that is in a hurry to get to its destination may not take the time to look for pedestrians or cyclists at intersections and crosswalks. Since taxicabs are common carriers, they must, by law, treat their passengers with the highest duty of care to ensure they remain safe. When accidents occur by a negligence of the taxicab driver, they are held to a different standard than average motorists since it is their job to know and obey all traffic laws and put the safety of their passengers first. Unfortunately, although all taxicabs must have insurance to cover their passengers in the case of an accident, getting paid for a crash is another matter. There have been many cases of taxicab companies trying to put all responsibility for accidents on the driver, instead of owning up to covering the accident costs under the broader scope of the company insurance. For victims of a taxicab accident, there may be a battle to get paid fairly for injuries and even wrongful deaths. Even in a seemingly simple auto accident where the taxicab is to blame, getting compensation may be difficult if there is a fight over whether the driver or the cab company is financially responsible. Due to the complexity that is often involved in taxicab accident liability, victims of these accidents need to have a team of seasoned legal advocates fighting for their rights. Leave the negotiating to an experienced Chicago personal injury lawyer that can work to get you the best financial recovery from those who are responsible. Rosenfeld Injury Lawyers LLC has a team of experts that understand the laws concerning taxicab accident in Chicago. We have years of experience in fighting aggressively for our clients' right and will fight for your right to maximum compensation for your injuries or loss. Call us today for a no-obligation consultation to discuss your legal options at (888) 424-5757.